Preserving old villages and farm buildings – and being more creative in designing new rural homes – could help halt the decline in European farmland bird populations, according to new research published today in the Journal of Applied Ecology. A small, old village called Kalitnik, located in the Podlaskie district in eastern Poland. Managed breeding of the Konik – a traditional Polish primitive horse breed (individuals of which you can see in the photo) – takes place here. There has also been restoration of black grouse Tetrao tetrix by the Polish Society for the Protection of Birds. Photo credit: Darek Świtała. The study, led by Dr Zuzanna Rosin of Adam Mickiewicz University, found that traditional villages in Poland are biodiversity hotspots for farmland birds, whose populations have declined at an alarming rate across Europe over recent decades. As agriculture becomes ever more intensive, traditional villages will play an increasingly important role in farmland bird conservation, says Rosin, so preserving the variety of farms, homes and building materials is key to conserving farmland birds, whose numbers have fallen dramatically. According the official State of Europe’s Common Birds, between 1980 and 2005 the population of crested larks declined by 95%, corn buntings by 61% and linnets by 54%. Previous studies have pointed to agricultural intensification, with the resulting loss of habitat, as a major cause of farmland bird declines. But the importance of old farms and villages to bird biodiversity has been little studied until now. Working in two regions of western and southern Poland, Wielkopolska and Małopolska, the team of ecologists from Poland and Sweden counted the number and species of birds at three spatial scales: single rural property, village and landscape. They visited 78 homes and farms in 30 villages, and recorded 12,000 individual birds from 135 species, including many species which are declining in Europe. They found that old rural properties had more birds, from more species, than buildings constructed after 1989 and that farmsteads hosted more bird species than homesteads. They also found that old, traditional villages are biodiversity hotspots for farmland birds, and that the proportion of new homes in a village has a dramatic impact on bird life. They found 20-25 bird species in villages with less than 10% new dwellings, but when new homes made up 40-50% of a village, fewer than 10 bird species remained. Poland is an ideal place to study the ecological effects of more traditional patterns of rural life and farming. 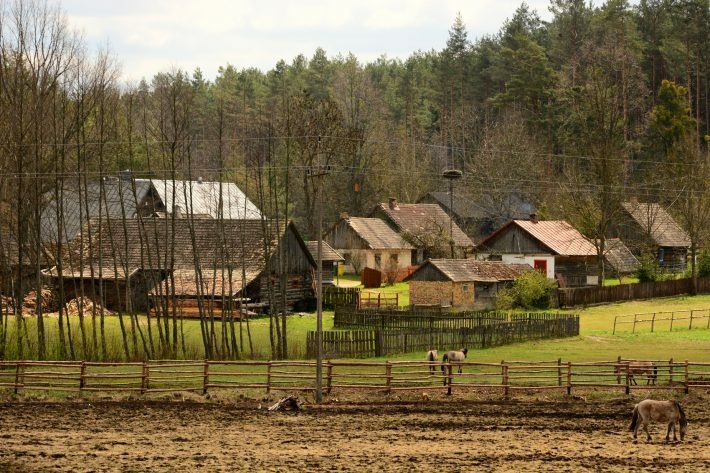 In contrast to western Europe, 50% of people in Poland still live in rural areas, where villages have a huge diversity of building structures, microhabitats and management. Agricultural land makes up 60% of Poland, which has 1.5m farms, 77% of which are less than 10 hectares. “The old buildings have a complex structure and many sites – from old roof tiles and thatch to chimneys and timber beams – that several species use for nesting. The surroundings of a house are also heterogeneous, with old trees, shrubs, gardens and orchards, which add to nesting and foraging opportunities for birds,” Rosin explains. Farms and villages in rural Poland are, however, under threat from the same socio-economic forces that have affected western and northern Europe over the past 50 years. The availability of imported food that followed the fall of the Berlin wall in 1989 made many small family farms in Poland uneconomic. As young people have moved to cities, old rural villages have declined. Financial support from the European Union has favoured large, modern farms and the ‘urban style’ of new houses in rural areas provides fewer nesting and foraging sites for birds. “Old villages are a key part of European farmland, but they are disappearing fast, taking with them the birds that nest and forage in them. If we want to halt the continued decline in farmland bird populations, we need to conserve these villages and their old properties,” she says. Supporting small-scale, traditional farming by boosting demand for high quality local food. “Fortunately it may be a win-win scenario that benefits rural communities, rural heritage and traditions, and farmland biodiversity,” Rosin says. Zuzanna M. Rosin et al (2016). ‘Villages and their old farmsteads are hot-spots of bird diversity in agricultural landscapes‘, doi: 10.1111/1365-2664.12715, is published in the Journal of Applied Ecology on 17 August 2016.